The presentations are available in pdf format from the Final Program page. 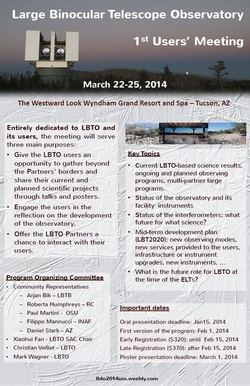 The LBTO 2014 Users' Meeting, the first of a long series (we intend to have one every three years...), is entirely dedicated to LBTO and its users. For the observatory, this first users' meeting comes at a very important time: LBTO is preparing a development plan which intends to bring the observatory to the forefront of astronomy by the end of the decade. For this plan to be successful, it must fit the expectations of those the observatory is serving: its users! - Give the LBTO users an opportunity to gather beyond the partners' borders and share their current and planned scientific projects through talks and posters, a great chance to build new multi-partners collaborations and to start building a real LBT community, something LBTO will need for its long-term future. - Offer the LBT Partner Representatives a chance to interact with their users and to measure the level of interest the future of LBT generates all over the partnership. The Users' Meeting will follow The Search for Life Beyond the Solar System: Exoplanets, Biosignatures & Instruments, a conference also held in Tucson March 16-21 and organized by the Vatican Observatory and the Steward Observatory.